Get to know the rulings made by the Inter-American Court, arranged by country. 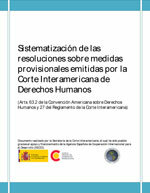 This document was done by the Secretariat of the Inter-American Court of Human Rights. (Only in Spanish). San José, Costa Rica, April 3, 2019. – On March 29, the Inter-American Court inaugurated the online module of the “Update Course on Jurisprudence of the Inter-American Court of Human Rights”, aimed at members of the Judicial Branch, the Prosecutor’s Office, the Public Defense Office as well as members of some of the key institutions for the protection of human rights of this country.